Most of my biological interest at the moment is in fighting off various viruses that seem to be interested in me!! So I am struggling to work up the energy to do anything and spend most of my time reading the paper. I have to thanks Steve Gale (again!!!) for his welcome and link and for pre-empting a number of my entries. So in the absence of much botanical activity at this time of year I thought I would deal with one of those he mentioned. 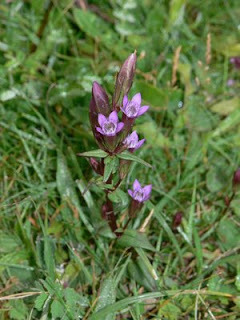 Banstead Downs is well known in botanical circles for Early Gentian, Gentianella anglica (left), a number of small colonies of which occur there. G.anglica is an annual/biennial, endemic to England and is one of five species of the genus that grows in Britain. 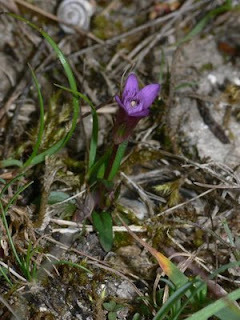 It is a plant of chalk and limestone and is considered endangered largely from loss of habitat. It is one of the species that is managed under the Plantlife “Back from the brink” programme and the population in Banstead has been monitored for many years and although the numbers vary from year to year overall it seems to be doing quite well. On Banstead Downs it grows in very short chalk turf (less than 5cm) and rarely reaches more than 5cm, in contrast to the other very similar species Felwort, G.amarella (right), that also grows on the Downs and other chalkland sites nearby, that can reach 20cm. The most obvious difference between the two however is that G.anglica flowers from April to June and G.amarella from July to September. Interestingly, a few years back a DNA study was published that suggested G.anglica is merely a form of G.amarella "that has been created and maintained as a consequence of former grassland management practices", i.e. they were the same species. I've not seen any more on this but knowing the two plants that does seem a bit strange. Something else about these plants is that their flowers open mostly when it is sunny, which for G.anglica means that it can be incredibly difficult to find on a cloudy day even when you know exactly where it grow. G.amarella also grows on Park downs just south of Banstead and in areas where there is heavy rabbit grazing stands out like a sore thumb. Presumably the rabbits don't eat in because of its bitter taste (amarella comes from the latin for bitter). 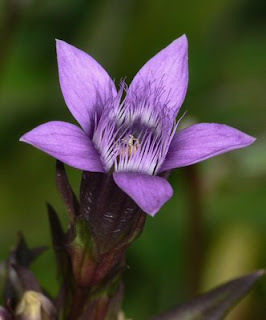 To show the true beauty of the flowers of this genus I have to include this picture (left) of Chiltern Gentian G.germanica that does NOT grow in this area but as the common name suggests it is restricted to the Chilterns in this country. Altogether a much bigger plant up to 30cm with many flowers. The picture shows the fringing to the corolla that separates this genus from Gentiana proper. Interesting post John. Cannot wait for the others that you are promising!